... as top financier threatens to stay back ...but Owusu Acheampong says JJ is a force to reckon with The National Democratic Congress (NDC) would be heading towards very big trouble, as financiers of the party have began sending warning signals to the founder of the party, Flt. 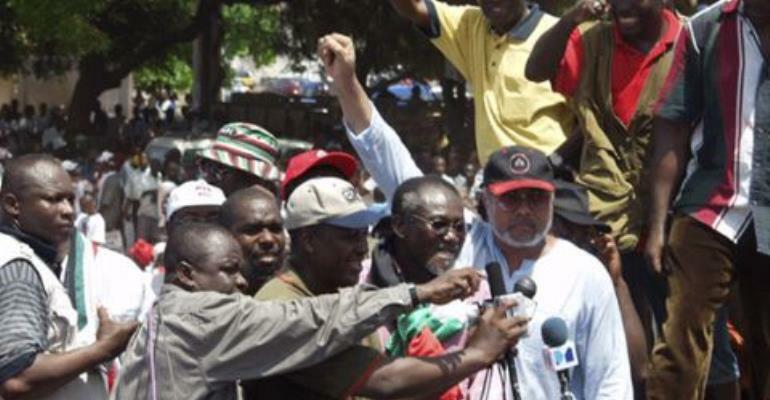 Lt. Jerry John Rawlings to desist from playing a leading role in the party. The financiers warned that if ex-president Rawlings continued to play a leading role, particularly in the election of a Presidential Candidate to lead the NDC in 2008, they would fold their arms, leaving the party to the mercy of poverty. A top businessman based in Accra and one of the regular financiers of the NDC, in an interaction with The Chronicle said, “ the issue of Rawlings playing a vital role in the election of a Presidential candidate must be a thing of the past.” This financier was reacting to media speculations that the former President is planning to push either his wife, Nana Konadu Agyemang Rawlings or Prof. Evans Atta Mills to the topmost position in the party against 2008 and his recent meeting with NDC Parliamentarians after the December 2004 election, asking them to go to the constituencies to rejuvenate the NDC. He wondered why the Chairman of the Party, Dr. Yao Obed Asamoah and the National Executive Committee (NEC) members were there, but the ex-President was trying to bypass them and give instructions to the Parliamentarians. The man was of the view that if the founder had any suggestions for the party, he could pass them on to the chairman or any other executive member of the NDC to be discussed, not bypass them and organize a meeting of such nature. He questioned, “Who controls NDC, Rawlings or the NEC?” “Some of us would not hesitate to pull out our financial support for the party, because we would not allow one man to kill the effort we are making,” he remarked. The NDC business tycoon, who deals in import and sale of vehicles, retorted that it was not only Rawlings who had ideas in the party and he knew people who could win elections. According to him, the NDC was a democratic party, and for that matter, it was not prudent for Rawlings to stay behind and allow National Executive Committee (NEC) members of the party and other leading members across the country to administer the affairs of the NDC. He was of the view that, the defeat of the NDC in the recent elections stemmed partly from the ex-President and nobody else. “ The NDC could have done something better, and even win the elections, but most people were afraid Rawlings would be controlling Prof. Atta Mills remotely,” he noted. In an interview with one of the National Executive Committee (NEC) members of the NDC however, it was manifest that Mr. J.H. Owusu Acheampong had seen the financier's comment from a different perspective. According to Mr. Acheampong, a former Minister of Parliamentary Affairs and Agriculture, the role of Rawlings in the NDC had two edges and that needed a very pragmatic approach. Mr. Acheampong indicated that ex-President was a founder of the party and for that matter, it was difficult to cut him totally out of the NDC. “If Rawlings is forced out of the NDC,” he said, “it is going to create a problem for them in 2008, because some regions, in particular, Volta may not be happy and this would go against the party.” He revealed that some of these financiers support the NDC because of ex- President Rawlings and not the NDC per se. Mr. Acheampong added that, “Rawlings is a very valuable asset of the NDC, so we can not dispose him off.” Beside, the NEC member was of the view that the former President was still a crowd puller for the NDC, particularly in the rural areas: “It is only the big towns, perhaps, NPP propaganda that makes people speak ghastly about Rawlings and his presence in the NDC,” he said. Mr. Acheampong therefore appealed to the financiers that if anything at all, they should sit down with the NEC to strategize things out and see how the Rawlings factor could be minimized, instead of threateneing to withdraw their financial services from the party. Clearly, Rawlings is the 'santrofie' bird of the NDC. Pick him and you've picked trouble, leave him and you've left your luck.